Houstonians will jump-start the 2018 holiday season with the 69th Annual H-E-B Thanksgiving Day Parade. Houston’s Thanksgiving Day Parade began in 1949, when Santa arrived at Union Station and rode his sleigh to the downtown Houston Foley’s department store. 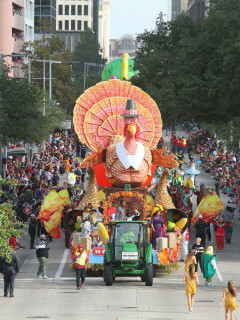 The Thanksgiving Day parade is a 69-year-old holiday tradition showcasing the Houston community and entertaining thousands of parade-goers lining the streets on Thanksgiving morning. The parade will wind through 20 blocks of downtown Houston beginning at Smith and Lamar, moving north to Walker, east to Milam, south to Pease, west to Louisiana, north to Clay, west to Smith, and north to end at Smith and Dallas. Smith St. & Lamar St.